My name is Brian Callan. I am originally from Ardee in Co. Louth but I now live outside Craughwell in Co. Galway with my wife and two boys. My interest in woodwork began in school where I was lucky enough to have a teacher whose passion for the skill inspired me to make a career from it when I left school. After running my own cabinet making business for several years, I returned to college to become a woodwork teacher and spent seven years teaching. Following the birth of my children, I took a career break to become a stay-at-home dad while my wife worked as a musician and music teacher. The harp’s accessible sound and therapeutic value makes it the ideal native instrument with which to introduce preschool children to music. Researching the topic quickly made me realise very few harps were actually made in Ireland, despite the instrument being our national emblem. I started working on many templates until I manufactured a first prototype in December 2011. I have now developed a range of fully hand-crafted harps made from locally sourced, naturally felled Irish native timber where possible. My harps are designed to suit all ages and abilities. 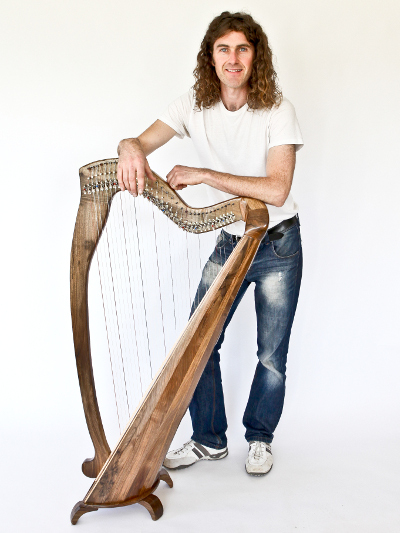 All harp pictures and portraits on this website were taken by Lorraine Cryan. Any other picture (workshop, new stock etc.) was taken by me. The harp is an ancient instrument dating back over 2,000 years. It is not known exactly when the harp arrived in Ireland, but travelling harpists playing around Ireland were very popular between the 12th and 16th century. The harp became our national emblem by the early 15th century and the instrument is heard in orchestras, traditional sessions or medieval festivals but it really shines as a solo instrument and as the perfect accompaniment to the voice. Harp making has thrived in Ireland for centuries; a tradition kept alive today by several craftsmen using Irish timber. Machines have made their job easier but the design and construction of the harp has not changed very much over the centuries.